We want your time with us to be relaxed and comfortable. We will go out of our way to make sure that your stay is trouble free and that you will start every day of your stay with us feeling fresh and ready to face up to the challenge of the ensuing twenty four hours…. 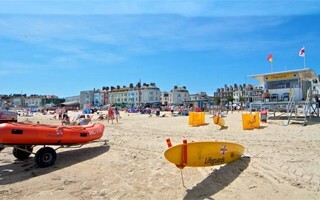 whether that’s a hectic day at work or a busy day relaxing on Weymouth’s award-winning beach!! All our rooms are centrally heated, with hospitality trays, hair dryers, and clock radios, and most are en-suite. All are equipped with a colour television, some with the added bonus of a DVD player. Some have king sized beds and one room is on the ground floor, providing easy access for people with minor mobility problems. There are good pubs and restaurants within five minutes walk and, of course, a much fuller range in Weymouth Town centre just ten minutes walk away. 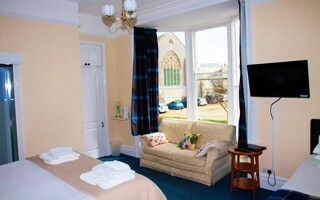 We are close to Weymouth train station, the main bus station and termini. An added bonus is that coach excursions into the beautiful Dorset countryside pick up practically outside our front door. If you would like to make a booking please call us on 01305 770382 or get in touch by e mail or by using the form on our contact page. 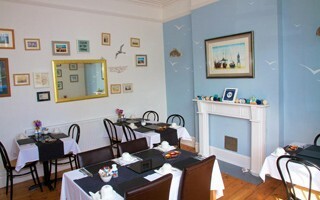 You can also check availability and book online by clicking the button below.